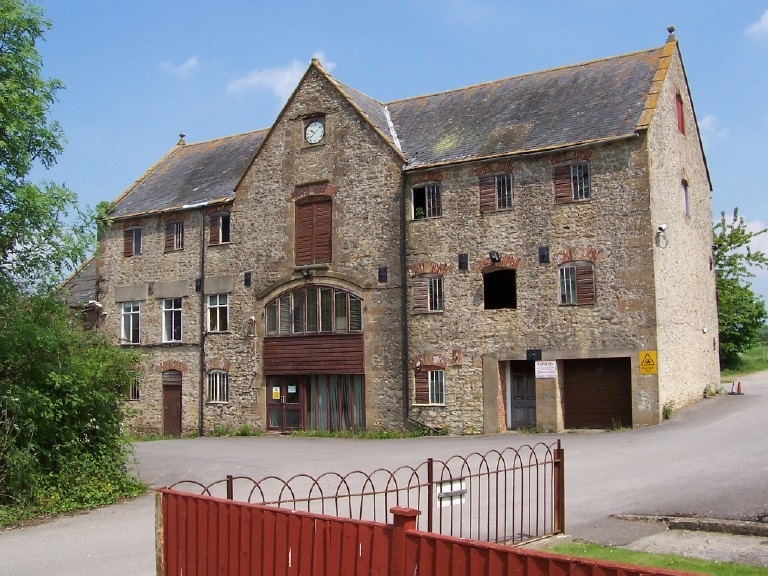 Broadway – The present importance of Broadway as the principal route through Merriott from Lopen dates back to at least 1765, when the name was adopted by the Crewkerne Turnpike Trust. [Victoria County History] Noted as a fairly narrow street! 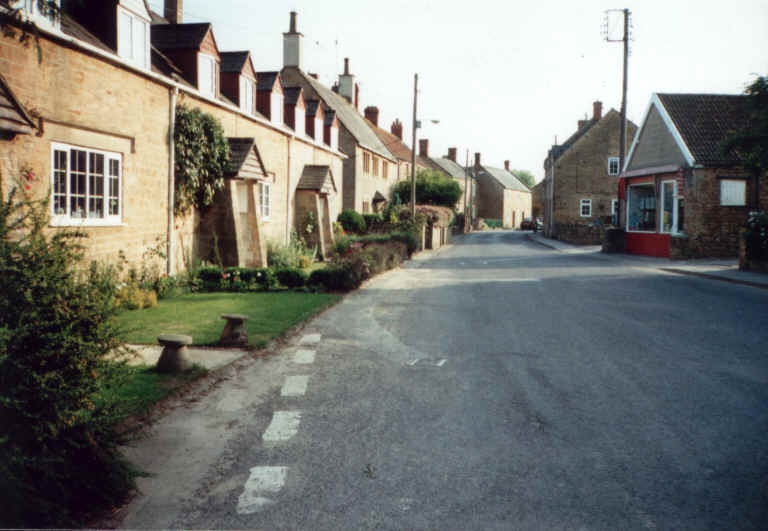 Higher Street – The street at the higher (northern) end of the village. Newchester Cross – Newchester Cross has at times been thought to have borne evidence of Roman remains, but no proof of this exists today. It was earlier named Newchurchyard Cross. There was possibly a triangle of grassed land here, upon which was erected a cross indicating the way to the church. Royal Nurseries – The richness of the soil in Merriott has made the village a suitable area for farming and market gardening since earliest times. Scott Elizabeth Wife M 38 F Surry, Kingston? Malcher? Mary Jane Niece U 10 F Surry, Kingston? 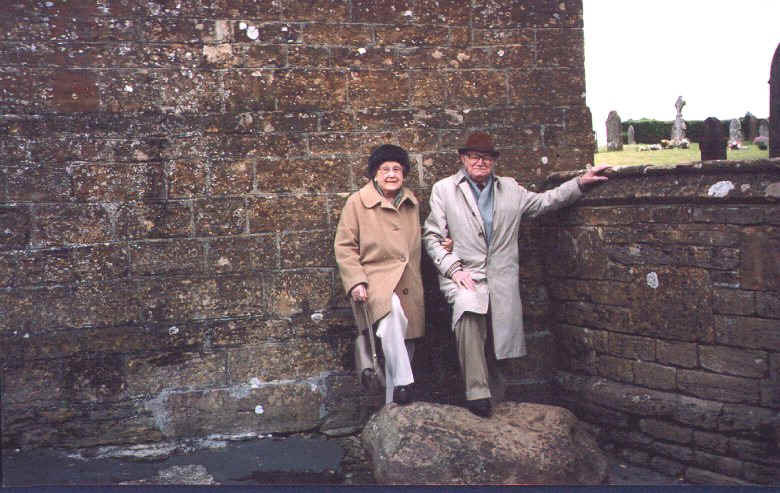 Edith and Leslie Westacott, standing with their backs to the old Merriott school. Their feet are on the “School Stone”. Leslie’s mom was born Emma Webb in Merriott in 1883, just across the road from the school in Sandy Hole Cottage. Emma told her children that she and her friends ate their school lunch sitting on this stone and thru the years it was called ‘school stone’. Leslie and Edith were a young married couple in London at the time of WWII. When the nightly bombings began and Les was called into service, Edith was sent to Merriott to live with her mother-in-law Emma. Edith said quite a few city people came to Merriott, Hinton St George and surrounding towns to escape the blitz. This dear couple celebrated their 62nd anniversary this year. For some amusing stories about Schooling in Merriott in the 1940s, have a read of David Gibbs’ anecdotes: My Quest to Become a Grammar School Nutshell and Salad Server Days. 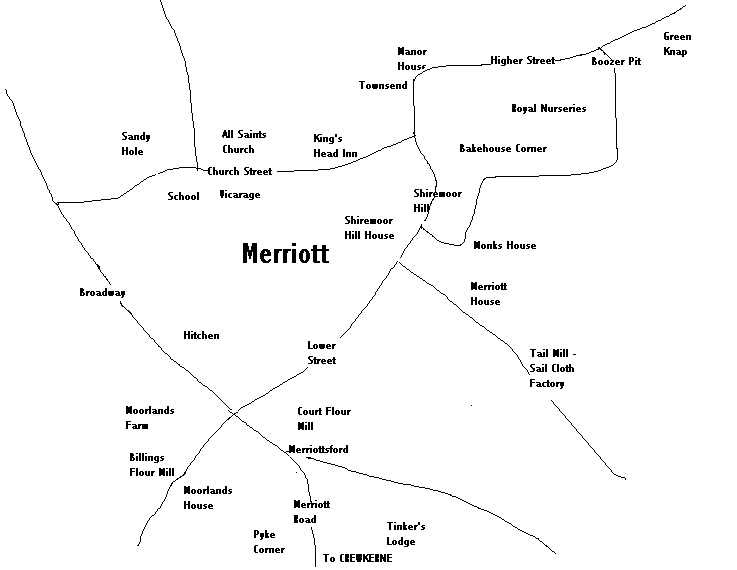 Townsend – Looking at the unusual shape of the village of Merriott, Townsend doesn’t appear to actually be at the “end of town”. Does anyone have an explanation? Perhaps it was actually at the end of town at an earlier point in history? I found this while perusing the 1871 Crewkerne Census. The enumerator, Benjamin Miller, went to great lengths to describe the area of Crewkerne close to Merriott. The bottom line is cut off on the copy I have, but the rest is clear. “Bow Gate, a Toll Gate with gate keeper’s house only. 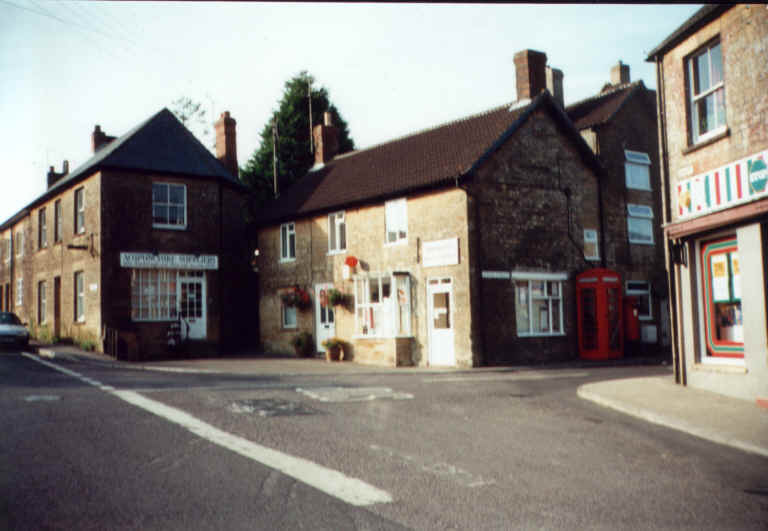 Haselbury Cross, consists of three cottages. Tail Mill, a factory for the manufacture of Sail Cloth, with Manager’s and workpeople’s houses adjoining. Merriottsford, a Private House called “Spring Cottage”, a Toll Gate, and a Farm house. Haymore Mills, Flour & Grist Mills with two houses. Ashlands is part of the town of Crewkerne, and a continuation of North Street. North Street. There is situate in North St a factory for the production of Sail Cloth called – “The Coker Sail Cloth Works”. Bow Gate, Tail Mill, Haselbury Cross, Great Field, Merriottsford, Tinker’s Lodge, and Pye Corner are in the parish of Crewkerne, but situate nearer the village of Merriott than the Town of Crewkerne. 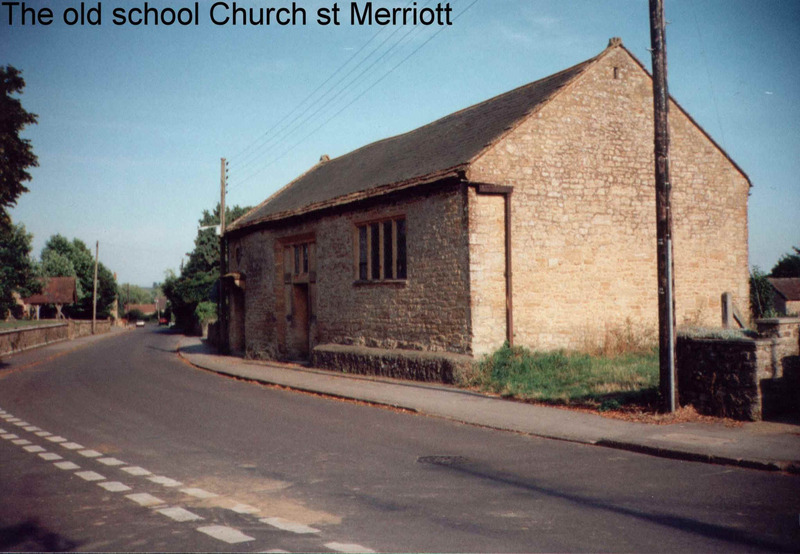 Have a look at David Gibbs’ anecdotes about the village of Merriott here.